TIPC deepens engagement in Latin America with Chile, Brazil and Colombia development visits. This month sees an extensive tour of Latin America by the Transformative Innovation Policy Consortium team. Taking in Chile, Brazil and Colombia, the TIPC team aims to assess how collaboration towards a Transformative Innovation Policy (TIP) approach can benefit each country in reaching outcomes that relate to achieving the Sustainable Development Goals (SDGs). The TIPC team, led by Professor Johan Schot and Dr Matias Ramirez, head to meet key policymakers in the region, and to deliver keynote lectures on TIP to academic and business audiences in each country regarding a transformative route to the SDGs and the UN Agenda 2030. The Latin America focus begins in Chile, where the TIPC team are hosted by the University of Talca. 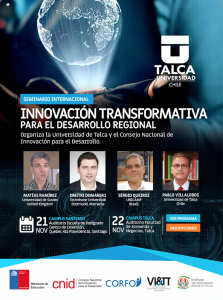 At events in Santiago and Talca, Dr Ramirez delivers keynote lectures on Transformative Innovation, focusing on transformative themes, organized with the Chilean National Council of Innovation, CNID, the Ministry of Education, the Chilean Economic Development Agency, CORFO and the Institute for Innovation and Science. Following Chile, the next leg of the trip, revisits Colciencias in Colombia, TIPC’s long-standing collaborator on TIP, to reassess the next steps for development on their work towards reaching the SDGs and transforming their society. Following the publication of the ‘Libro Verde’ which expresses how a transformative approach can benefit Colombia, Professor Schot and Dr Ramirez meet with the new Colciencias Director, Sonia Monroy, followed by the UK Ambassador to Colombia, to discuss the next steps in collaborations. The final stage of the Latin America engagement and development work is in Brazil, where the delegation attend Brazil’s first Global Forum on Innovation and Technology for Sustainability, FITS 2018, held at the Museum of Tomorrow in Rio de Janeiro. Professor Schot shares a platform for the opening keynote debate with Luis Felipe López Calva, Assistant Secretary General of the UN and Regional Director for Latin America and the Caribbean for the United Nations Development Programme (UNDP). Professor Schot shall share the ideas and theory behind TIP with a broad audience including private sector business leaders, the third sector, multilateral organizations, regional players, policymakers, civil society and fellow academics. 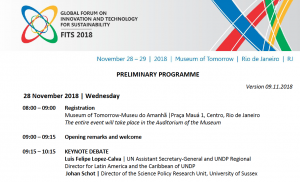 The Global Forum is organized by the Centro Global de Inovação e Tecnologia em Sustentabilidade and the UNDP, which receives support from the Brazilian Ministry of Science and Technology. At the Forum, Dr. Ramirez leads a session on the ‘Experience of National STI Agencies in Leading the Development of Transformative Innovation’ sharing the Consortium members’ experience of developing TIP in their contexts to share knowledge and understanding. Whilst there, the TIPC team will also take part in the workshop “Transformative Innovation Policy Consortium (TIPC) and opportunities to promote science, technology and innovation for sustainable development in Brazil”, organised by the Brazilian Ministry of Science and Technology (MCTIC) and the Brazilian Innovation Agency (FINEP), to introduce the Consortium and to discuss ways of working together. Attending are both Brazilian academics working in the Sustainability Transitions and socio-technical field, along with representatives from British Council and British Consulate. Initial contacts between MCTIC and TIPC started with a post-doc research project being carried out at the Science Policy Research Unit (SPRU) at the University of Sussex Business School, by MCTIC`s employee, Ana Lucia Stival, who has been studying and analysing how a TIP approach could benefit Brazil. 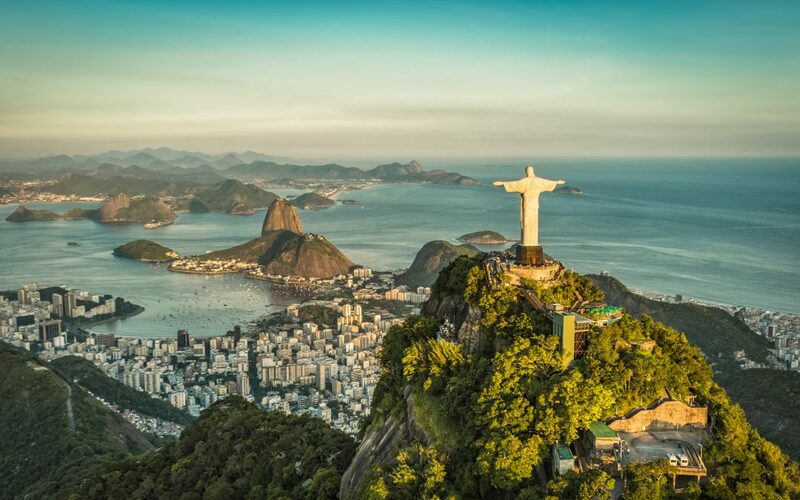 As part of a year’s research fellowship Dr Stival is examining how current science policies in Brazil orientate and map across meeting the SDGs.